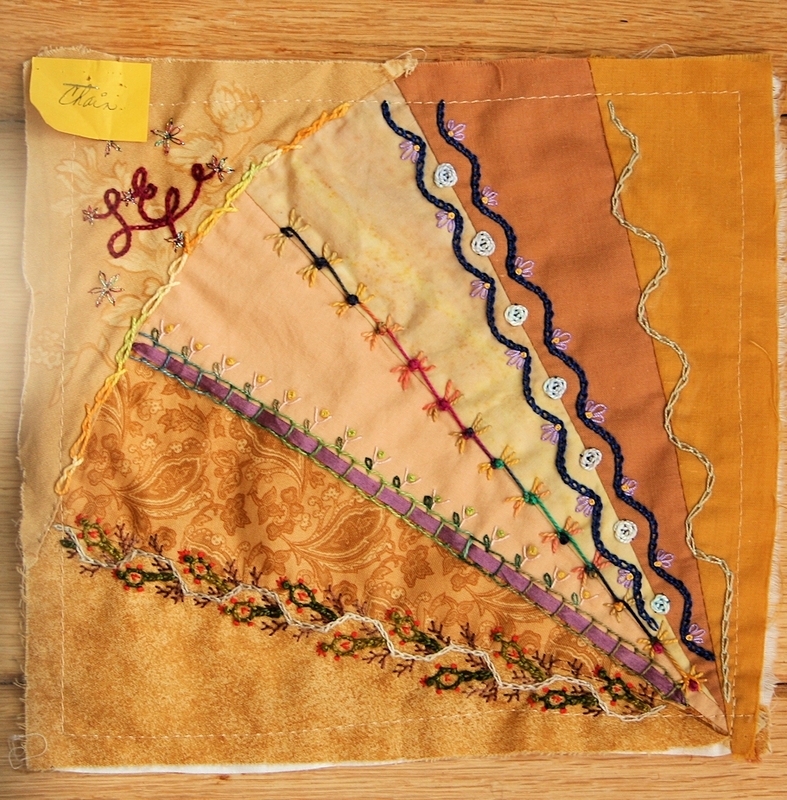 I’m in a crazy quilt round robin and finally finished working on Leslie’s blocks. 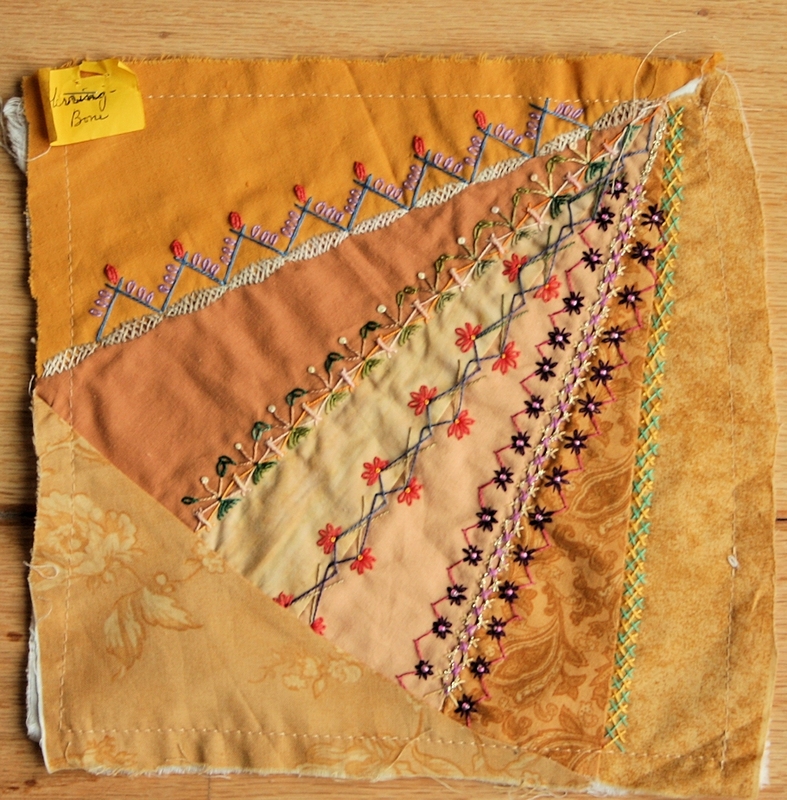 These were gorgeous blocks to embellish, and I totally relaxed and enjoyed the process this time. 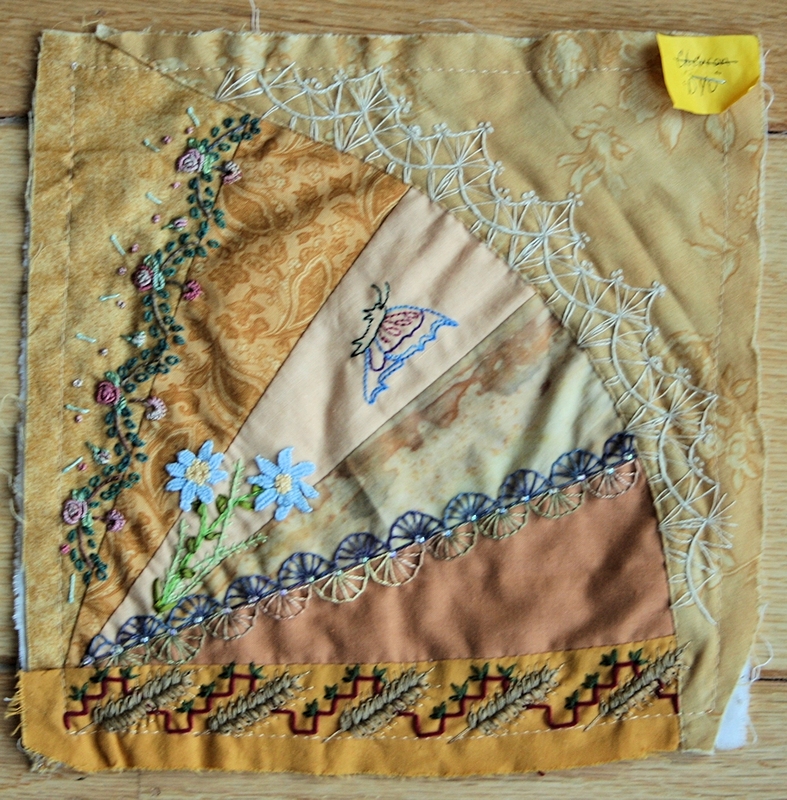 This was the buttonhole block and I added a buttonhole wheel, fly stitch, detached chain stitch, French knots, and the Bonnet stitch to this block. I added to the blue on the left seam and started a new section with the green at the top. Tentakulum Chagall, silk buttonhole twist, my hand dyed 100 wt silk, and DMC Perle #8 were the threads used. 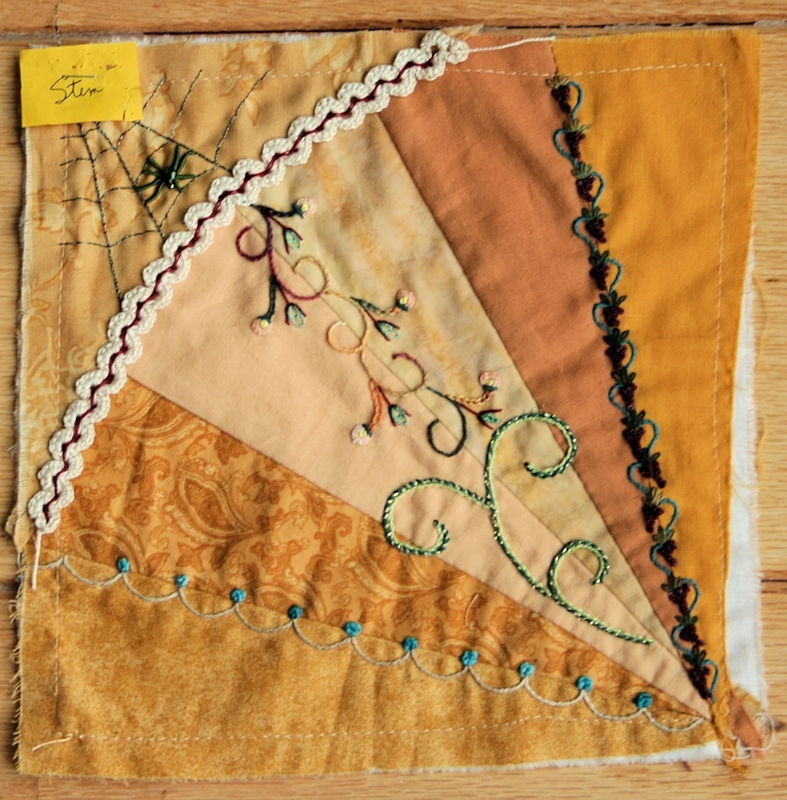 On the chain stitch block, I wove ribbon through a base row, embroidered two wavy chains and placed woven spider wheels in between, then added detached chain stitch, and French knots using silk ribbon, DMC Perle #8, YLI’s Jean Stitch and DMC #5. On the chevron block, I added an area of double chevron, closed fly stitch leaves, stem stitch, French knots and half chevron. Threads used were YLI’s Jeans Stitch, DMC floss, Wooly Nylon metallic, and Wildflowers. 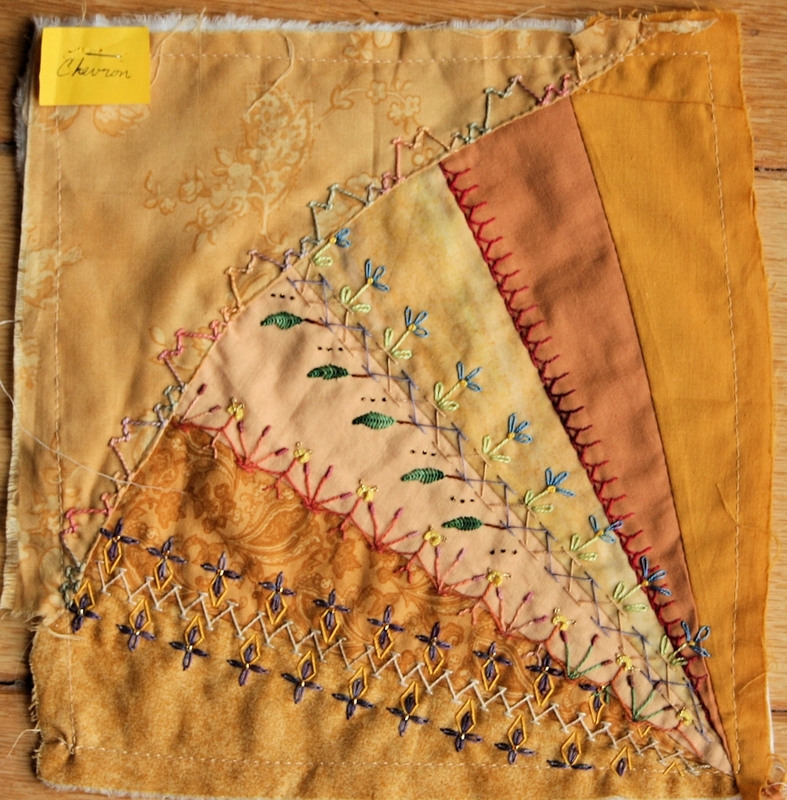 On the Cretan block, I added open pyramid Cretan stitch, buttonhole bar, fly, straight and French knot sitches. 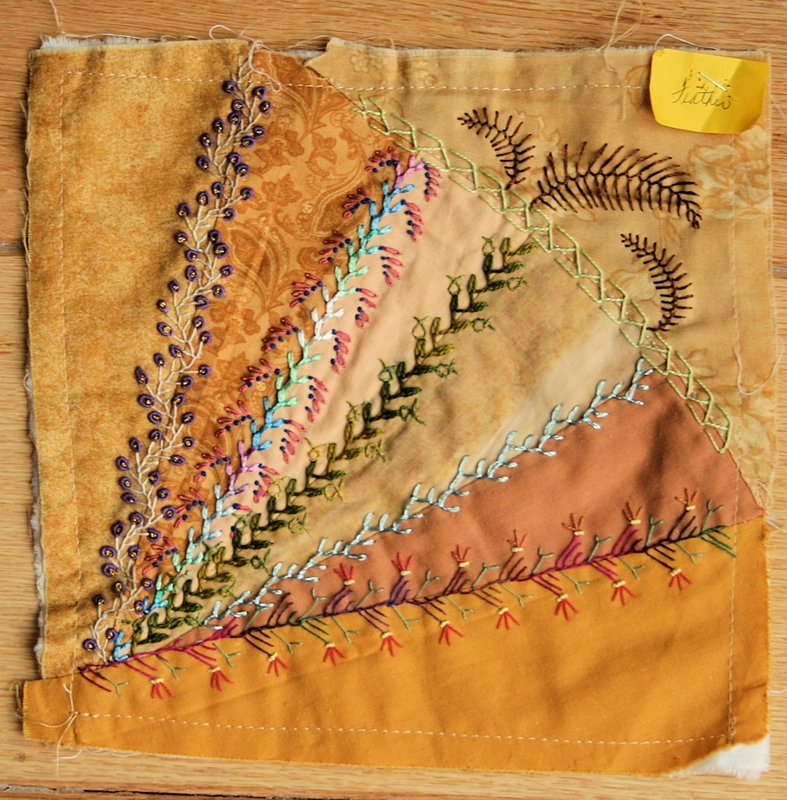 Threads used were Wildflowers, Threadworx, and my hand dyed 100 wt silk thread. On the do your own thing block, I embroidered all along the top curve trying to make it look like lace. 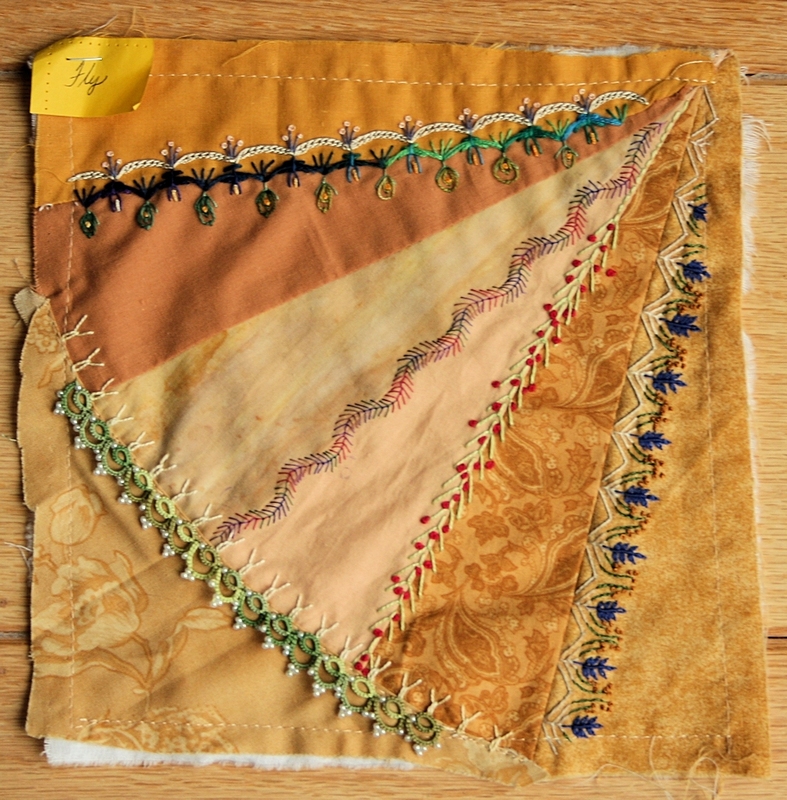 I used stem, straight, detached chain and French knot embroidery stitches with one strand of a fine DMC linen thread. 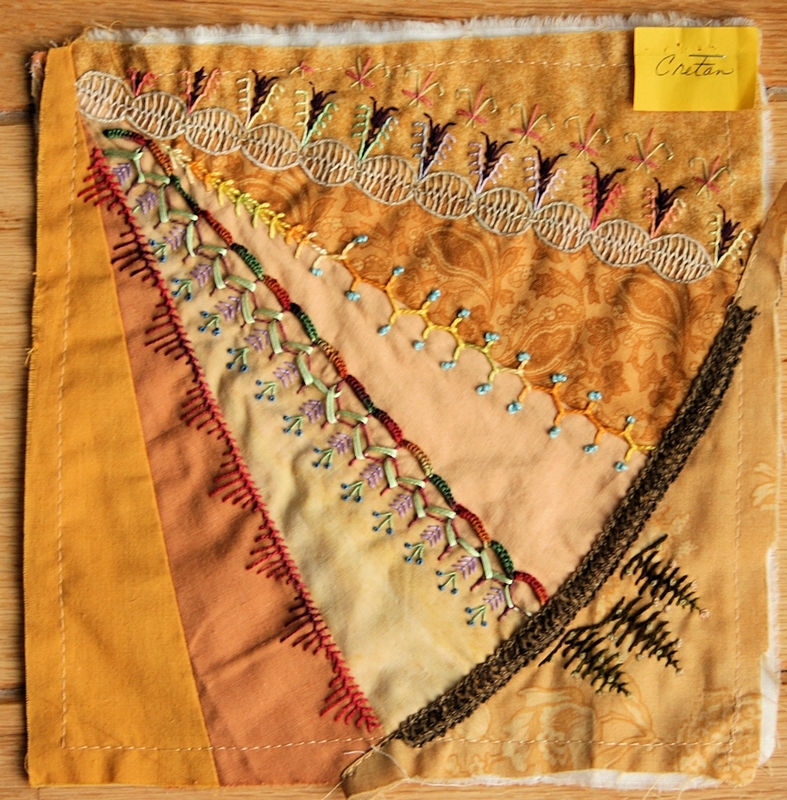 On the feather block, I embroidered 61, yes 61 bullion loops stitches with 15 needle wraps for each stitch, French knots and triple feather stitch, using 12 wt Aurifil cotton thread – 1 strand, DMC Precious Metal 1 strand, and DMC rayon – 2 strands. The bullion loops are on the seam on the left. On the fly block, I embroidered wavy fly, Hungarian braided chain, straight stitches, and French knots, with 30wt Sulky, Silk buttonhole twist, YLI Jeans Stitch, and DMC Pearlescents. On the herringbone block, I embroidered detached herringbone, detached chain, oyster and double herringbone stitches with 2 strands of my hand dyed 100 wt silk, YLI’s Jean Stitch, and DMC Perle #8 threads. On the stem block. I embroidered split stem, stem stitch roses, and I crocheted a trim to cover the curved seam. 10/2 cotton was used for the crochet braid, and YLI Jeans Stitch and DMC floss – 6 strands were the threads used for this block. I hope Leslie will like what I added to her blocks. This is my annual update on how much I’ve managed to clear out of my home, knitting studio, and sewing studio. This year’s count was 138 pounds. I really wanted to get more out, but found it hard to stay motivated this year, as I doubt we will ever be moving out of state. I like the dry desert Arizona weather, and my husband likes the humid southeast. Neither one of us is budging, so I’m guessing we’ll stay put in Upstate NY. I did get a total of 2,871 pounds out of here in the last 8 years. Since the need to destash is not as immediate anymore, I pretty much well decided I’m going to refocus my efforts, and concentrate on organizing my supplies. It would be sooooooo good to have all my sewing equipment in one studio, and all my knitting equipment in the other. The two rooms somehow encroached on each others territories. This will require the closets being totally rearranged, and some furniture being moved around. Hopefully, this organization will occur this year, and I just might take before and after pictures – if I can get over my embarrassment about just how bad those two rooms look at the moment. I wish a Happy, Healthy, and Creative New Year to all my blog readers.